To get audio from a network media player, media streamer, or another audio source device so you can hear it, it must be connected to either a stereo amplifier, stereo or home theater receiver, or "powered speakers." Speakers make sound by vibrating. They need the power to vibrate the speaker surface at a level that will move enough air to direct sound ways that we can hear. The speakers we connect to our AV receiver or stereo amplifiers are passive speakers that require power from the amplifier to which they are connected. Without connecting to an amplifier, the speaker drivers do not have the power to vibrate the speakers and reproduce the sound. Traditional speakers are referred to as "passive speakers" as they require power (in addition to the audio information) to be fed to them from an external source (such as an amplifier or home theater receiver) order to produce sound. On the other hand, powered speakers, which are also referred to as "active speakers." have their own amplifier built-in to provide power to the speaker - so all you need is an audio source signal to produce sound. When you connect a source to these speakers (such as a CD or DVD player, a music streaming device, or your computer) the music will come through the speakers at a volume that can be controlled and loud enough to hear without the use of an additional external amplifier. However, instead of traditional speaker wire used in passive speakers (which supply both power and the audio signal, powered speakers connect to its music source using a "line input", such as the red and white, right and left cables used to connect the sound from a CD player, TV or component to an amplifier or home theater receiver. However, you might find that powered speakers that are designed to connect to a computer will only have headphones mini connection and not the auxiliary line-in interconnect ports. For these speakers, you will need adapter cables that have to interconnect red and white cables on one end and a headphone (mini) jack on the other end. In addition, some higher-end powered speakers also feature digital optical inputs, which provides better sound from source devices that also include this type of connection option. Another use for powered speakers is in wireless speaker systems or Wireless Powered Subwoofers. In this type of setup, instead of connecting audio cables from your source device to the powered speaker, a transmitter connects to your source device (provided with the wireless speaker package). The transmitter then sends any outgoing audio signals from the source directly to the targeted wireless speaker(s), which have their own built-in amplifiers as required, which in turn produces the sound. Also, in the portable speaker category, the increased use of Bluetooth and other wireless technologies allow compatible devices, such as smartphones and tablets, to transmit music wirelessly to a powered speaker that has a Bluetooth or other type of compatible wireless receiving capability built-in, such as AirPlay, DTS Play-Fi, Yamaha MusicCast, Denon HEOS. 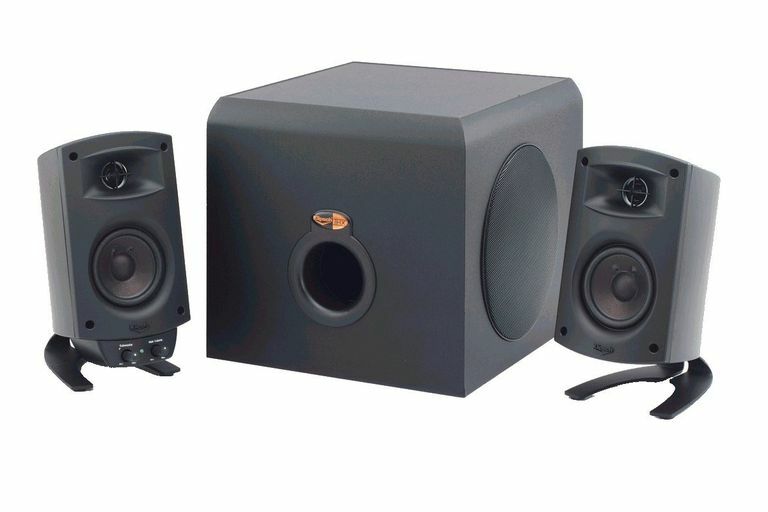 As with all speakers, the price of powered speakers varies with speaker quality. You may be familiar with powered speakers that connect to a computer that can run anywhere from $10 to $99 for a basic speaker or system for use with a smartphone, laptop, or PC to hundreds (or thousands) of dollars for higher-end systems that are more applicable to the home theater environment. Powered speakers (whether wired or wireless) can some as a single unit designed for portable use, a basic two-channel configuration for use with for a PC or modest setup, high-end two-channel setups, or in 5.1 channel configurations that can deliver a more surround sound type of listening experience for higher-end PC gaming or home theater setups. There are advantages to using powered speakers instead of a stereo or AV receiver. When you connect your audio source directly to powered speakers, you don't need to walk over and turn on the stereo or receiver. Instead, you can start music playing immediately from the controller, or, in some cases, a controller app for iPhone or Android device. Also, in the case of wireless speakers, you don't have all that connection cable clutter.